Pramod Sawant took oath as CM after midnight Monday, with Sudin Dhavalikar of the Maharashtrawadi Gomantak Party and Vijai Sardesai of the Goa Forward Party set to serve as his deputies. 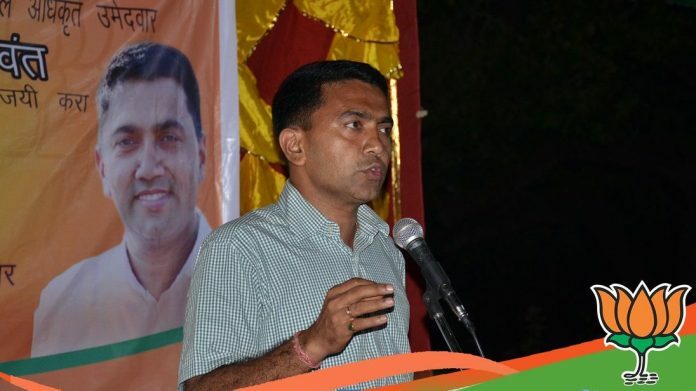 Mumbai: Goa assembly Speaker Pramod Sawant, a member of the Bharatiya Janata Party (BJP), was sworn in as Chief Minister after midnight Monday, as the party managed to convince regional allies to continue with the alliance despite consensus leader Manohar Parrikar’s death. The Maharashtrawadi Gomantak Party (MGP) and Goa Forward Party (GFP), the regional allies of the BJP, bargained hard in their nearly 24-hour-long negotiations with the national party. As a result, Sudin Dhavalikar of the MGP and Vijai Sardesai of the GFP are set to serve as deputy chief ministers of the tiny state. Beginning Sunday night, several rounds of discussions took place at Panaji’s Cidade de Goa hotel between the BJP, represented by Union minister Nitin Gadkari and later by party chief Amit Shah, and Dhavalikar and Sardesai, as well as independent MLAs. The back-and-forth, however, went on for another four hours. Even as an official statement from the government said the swearing-in ceremony would take place at 11 pm, it had to be pushed back by more than an hour for eleventh-hour talks between the allies and Gadkari. The Congress, which twice staked claim to form the government over the last three days, did not get a response from Governor Mridula Sinha. Sawant, 45, is a two-term BJP MLA from North Goa’s Sanquelim constituency, and was elected as the Goa assembly Speaker in 2017. What made Sawant the most popular choice within the BJP was that, much like former CM Parrikar, Sawant is a thoroughbred Rashtriya Swayamsevak Sangh (RSS) man, who has grown within the BJP cadre. By profession, Sawant is an ayurvedic doctor. His wife, Sulakshana Sawant, is also a BJP worker and currently heads the BJP Mahila Morcha in Goa. He was in the running as a replacement CM even in October 2018 when Parrikar’s health had deteriorated and he had to spend a month at New Delhi’s All India Institute of Medical Sciences (AIIMS). Among other alternatives, the BJP also considered Goa cabinet minister Vishwajeet Rane, who first got elected as a Congress MLA but resigned and defected to the BJP. Rane, son of former Goa CM and senior Congress leader Pratapsingh Rane, was also instrumental in getting two Congress MLAs to defect to the BJP in October last year, further reducing the opposition’s strength in the assembly to 14. After the 2017 assembly elections, the BJP had staked claim to form the government even though the Congress was the single-largest party with 17 MLAs. The party quickly cobbled up an alliance with smaller parties and Independents and moved Parrikar, who was then union defence minister, from New Delhi to Goa, as he was the only consensus leader among all allies. Parrikar’s death put the patchwork alliance in the balance, with the BJP struggling to find a candidate who could have everyone’s support as well as accommodate the aspirations of its alliance partners, especially the MGP and GFP. Multiple leaders close to the developments said that the MGP wanted to see Dhavalikar, the senior-most leader in the Goa cabinet after Parrikar, as CM, a demand which GFP and Independents strongly opposed. Dhavalikar’s demand also opened doors for GFP’s Sardesai to stake claim on the post. Both leaders were part of the three-member cabinet advisory committee that Parrikar would appoint to oversee governance during his long medical absences. By Monday afternoon, talks reached a stalemate as both the GFP and MGP demanded the deputy CM’s post, among other things, prompting the BJP to explore the option of having two deputy CMs, a senior BJP official said. Meanwhile, the Congress, which rushed a letter to Governor Sinha within hours of Parrikar’s death being announced, kept waiting for her response all day Monday. Party legislators stayed put at Raj Bhavan. “We have given a letter to the governor telling her that we have our single largest party and saying that we have a leader. We have requested her to invite us to form the government. We are waiting for a response,” said Girish Chodankar, Goa Congress president. He, however, refused to disclose who the party’s chosen leader was. Party insiders said, after Parrikar’s death, the Congress approached the lone Nationalist Congress Party (NCP) legislator, Churchill Alemao, to support the party.